China’s attempt to include Europe into its Belt and Road Initiative to create a giant economic zone has apparently gained momentum. 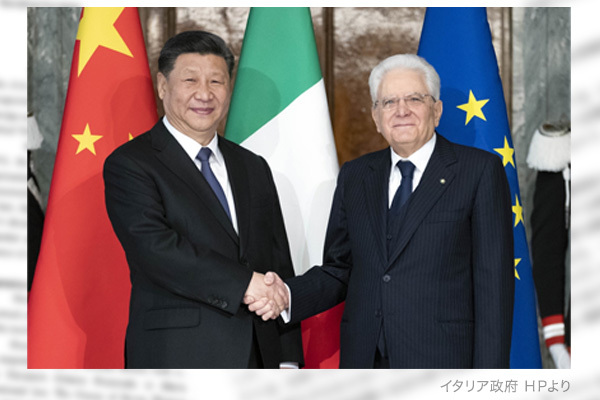 During a visit to Italy to launch a European tour, Chinese President Xi Jinping met with Italian President Sergio Mattarella and Prime Minister Giuseppe Conte in Rome on March 22 and 23, signing a memorandum to reaffirm the promotion of the BRI. Chinese Premier Li Keqiang plans to visit Brussels for brief talks with European Union leaders on April 9 before staying in Croatia, where he would discuss about the BRI as a main theme at an annual 16+1 summit for China’s economic cooperation with five Balkan countries and 11 Eastern European EU members. The memorandum signed in Rome promised cooperation in developing infrastructure including roads, ports, and telecommunications networks. Among the Group of Seven Western industrial countries, Italy became the first to sign this kind of memorandum with China. At a time when Europe was generally growing alert to China’s expansion of influence, Italy got out of step with other European countries. This is because (1) the present Italian coalition government consists of two populist parties – Five Star Movement and League – that advocate against the EU and immigrants, (2) Italy confronts with the rest of the EU over budget allocation, and (3) Italy wants Chinese investment to revive its faltering economy. However, the Italian government has an internal feud over how to deal with China, as indicated by Deputy Prime Minister and Interior Minister Matteo Salvini’s absence from a dinner for welcoming the Chinese president. Salvini heads the League. How Italy would engage with the BRI is a future problem. If China participates in port construction at Trieste, Genoa or Sicily, it may develop into a European security problem beyond a simple economic issue. On March 22 when President Xi arrived in Rome, EU leaders met in Brussels to consider how to deal with China exerting economic and political influence on Europe. It might have been the first time for the whole EU to discuss about China since the 1989 Tiananmen Square massacre where Beijing cracked down on democracy movements by force. A sense of alarm against China, which has expanded in the United States over the past few years, seems to have spilled over to the whole Europe at last. At the EU summit, German Chancellor Angela Merkel told the Italian prime minister that any memorandum with China should be checked in detail. Given that 13 EU members including Greece and Portugal signed memorandums with China before Italy did so, however, China could divide the EU. The U. S. has taken a tough stance against Huawei Technologies Co. and other Chinese telecommunications giants as national security threats. Can the EU keep step with the United States in dealing with the matter? The U. S. and its allies have been forced to become defensive against China’s offensive, revealing weakness of the Western alliance. Tadae Takubo is Vice President of the Japan Institute for National Fundamentals and a professor emeritus at Kyorin University.